Bonsoir, all! I recently visited Rome with UOB Photosoc, where we spent four glorious days in the sunnier climes of Italy, traipsing around the capital with too many cameras about our personage (there is a curious law which states that only a maximum of two cameras can be brought into the country, yet this was flouted by various members of our group to no ill outcome). With a wonderful 3am start - yes, I do mean that in the most sarcastic manner possible - we left a rather chilly Bristol and arrived in Rome in great need of sleep. Unfortunately we were instead treated to an hour's wait as poor Ceilidh's luggage managed to get trapped in the depths of the conveyor belt system. The remainder of the first day was spent sourcing lunch, coffee and dinner, leaving very little time for photo opportunities. 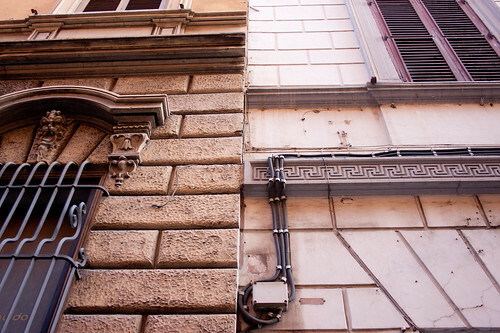 On the second day, we went on a walk around areas including Piazza di Spagna, led by the only non-Photosoc member on the trip, the brilliant Keith - without him, we would doubtless have been utterly lost and you'd only be looking at photographs of the inside of a hostel. 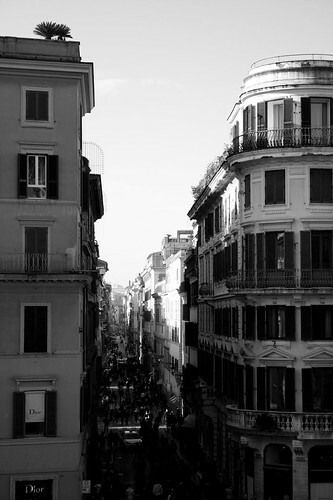 View from the Spanish Steps. More here. I will be updating the set over the next couple of weeks, so do check back. Brighton metallers Architects kick off 2011 with an incendiary fourth album, ‘The Here And Now’. The band have pushed boundaries even further than on 2009’s ‘Hollow Crown’, with first single ‘Day In Day Out’ leading the charge. Right from the start, it is clear that vocalist Sam Carter has developed his technique admirably, effortlessly switching between brutal growls and clean vocals. Album highlight ‘BTN’ opens with a relentless guitar intro and features a stunning level of talent from drummer Dan Searle. Guest spots from Comeback Kid’s Andrew Neufeld and The Dillinger Escape Plan vocalist Greg Puciato add an extra kick to two of the heavier tracks. Carter noted that this was the first time the lyrics were completed before the band went into the studio and this is especially evident from the sincerity of ‘An Open Letter To Myself’. The atmospheric distorted guitar lines of ‘Red Eyes’ are reminiscent of Thrice and the vocals on this song are particularly outstanding. The heavy metal sensibilities of Architects’ previous albums are still very much a focal point of their music and the abundance of milder moments on this record should only be seen as a step to the band becoming an established name in rock. ‘The Here And Now’ far surpasses anything Architects have done before. 1 Brand New - Didn't release anything new last year...stunning band though. 2 Funeral for a Friend - The Young and Defenceless EP was out in September. Their new album should be released this side of 2011, go and pledge for it! 3 Lostprophets - Fourth album The Betrayed was released in 2010 and wasn't bad at all. My personal Lostprophets highlight of the year had to be seeing them live - something I had been waiting for since first hearing Shinobi vs Dragon Ninja back in 2002. 4 Reuben - They broke up ages ago, but I purchased the rarities collection, We Should Have Gone To University, since Banquet Records were out of Glassjaw albums. 5 Saves the Day - No new material released in 2010, but the new album is set for a 2011 release. Very much looking forward to this. 6 Alexisonfire - The Dog's Blood EP was a cracking return to the scene for Alexisonfire, pushing the boundaries of their previous material. 7 Britney Spears - Another Britney Greatest Hits compilation was produced, with a brand new track, 3, released as a single. That was a strange one, not quite up to the standard of Circus. The reason for her appearing high on my list is probably nothing to do with 3, and more to do with repeated listening of this playlist. 8 Senses Fail - Their new album was out towards the end of 2010 and I still haven't heard it. Nevertheless, I had their old material on a lot last year. 9 Thrice - Amazing band, nothing new released in 2010 but I had Deadbolt on repeat. That little piano outro just offsets the chaos wonderfully. 10 Gallows - Nobody knows if there will be any new Gallows material in the near future, but we can keep our fingers crossed. I managed to miss out on seeing this lot at The Peel once again, as poor Steph was unwell and the show had to be postponed...and of course I was back in Bristol by that time!